Sample Data :Western blot analysis of IKK epsilon in Jurkat whole cell lysate with IKK epsilon/IKK-iota antibody at 1 ug/mL. 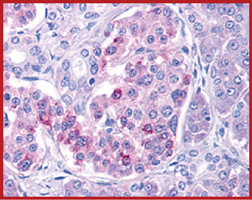 Sample Data :Immunohistochemistry of IKK epsilon in human pancreas tissue with IKK epsilon antibody at 10 ug/mL. 2. Shimada T et al: IKK-i, a novel lipopolysaccharide-inducible kinase that is related to IkB kinases. Int Immunol 1999;11(8):1357-62.